We are committed to making our services available online and easy to use. Work zones require everyone to stay alert and be prepared for sudden changes that distracted drivers may not notice in time to prevent a crash. 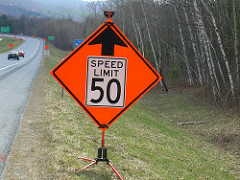 It is up to each of us to be vigilant when driving through or near highway work zones. Work zone safety doesn't just occur during daylight hours - rules apply 24/7. To help keep work zones safe, please slow down, maintain a safe following distance, stay alert, and expect the unexpected. Don't wait in line! Use our online services instead!